DUBROVNIK, Croatia — “This was where they filmed the peasant scene. I was so happy in that scene with Tyrion and Bronn. They are my favorite characters — next to Jaime.” Dubrovnik resident Ivana Radic is giving me a walking tour of “Game of Thrones” locations. We’re high up on the old city walls looking down into St. Dominic Street in Old Town. The narrow street below is quiet. On one side are the high walls of a church, and on the other, the walls reach right up to the city walls where we are, with lamps set into the walls. Just one or two people pass along the limestone paving stones, but in “Game of Thrones” it was the set for a bustling market scene, with carts, goats, horses, dogs, and peasants selling everything from fresh fish to fruit, as the characters Tyrion and Bronn walked and plotted. Ivana was an extra in the hugely popular HBO fantasy show — based on the hugely popular series of fantasy novels, “A Song of Ice and Fire,” by George R. R. Martin — and she gives walking tours of the locations, guiding visitors through the storyline and the places used, spicing things up with gossip from the production. She also tells the stories behind the locations, linking the show’s story, which is set in medieval times, to Dubrovnik’s rich history. This is why I am here: to find out the true stories and history of the locations, the historical myths and legends behind the castles and fortresses and landscapes used in the show. Dubrovnik was founded in the seventh century and was once one of the richest maritime republics in the Mediterranean. To protect its wealth, the city was surrounded by nearly 1.2 miles of thick walls (up to 20 feet thick and 82 feet high in places) that are still intact, with three fortresses, 16 towers, and six bastions. Walking into the city (which is all pedestrianized) over a bridge that crosses a moat, and then passing the drawbridge, it all feels very medieval. Just inside the city gate are the steps up to the city walls, from where we can see over red-tiled rooftops, down into the streets of Old Town and the gardens of some of the houses, and out over the blue expanse of the Adriatic Sea and the Elafiti Islands. After the city walls, next on the “Game of Thrones” tour we climb hundreds of steps up to Fort Lovrijenac (St. Lawrence’s Fort) just outside the city gate. As we look across to the city walls, there are flags flying from the battlements. We can see the circular Fort Bokar, where Joffrey prepared canons for battle. There are still canons on the fort — perhaps to warn off any would-be invaders, although Ivana assures me they are replicas. Farther down is the tall and round Minceta tower, with battlements on the top, where the House of The Undying scenes were set. In the distance, a replica galleon glides slowly toward the tree-filled island of Lokrum, home of the fictional city of Qarth, and seeing it, I feel like we have stepped back in time. The gardens of the now abandoned Benedictine monastery on the island are where Daenerys Targaryen’s party was held in “Game of Thrones.” She wasn’t too happy there — and in real life, a curse is said to befall anyone who stays on the island overnight, so it is uninhabited except by a few peacocks. However it’s a peaceful place to visit for a day. One can get to the island on a short ferry ride from the city’s harbor and walk among the cypress and pine trees or in the botanical gardens. All of the locations we visit seem the perfect location for King’s Landing, the fictional capital of the Seven Kingdoms of Westeros and seat of the disputed Iron Throne, but this may be more than a coincidence. An archeologist by profession, Ivana has read Martin’s series and felt the author had a familiarity with the city. “When I first read the books, the descriptions of King’s Landing seemed so familiar, I was certain Martin must have at least used a postcard for inspiration,” she says. 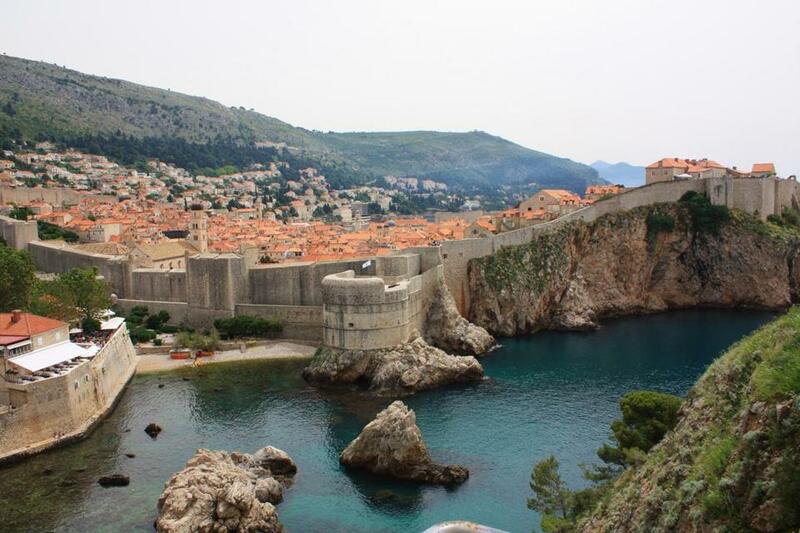 It’s no surprise then that when the “Game of Thrones” producers first saw Dubrovnik, with its city walls, moats, drawbridges, and fortresses, it seemed like King’s Landing was already there — and all the time I was there, it felt like I was in the fictional city. 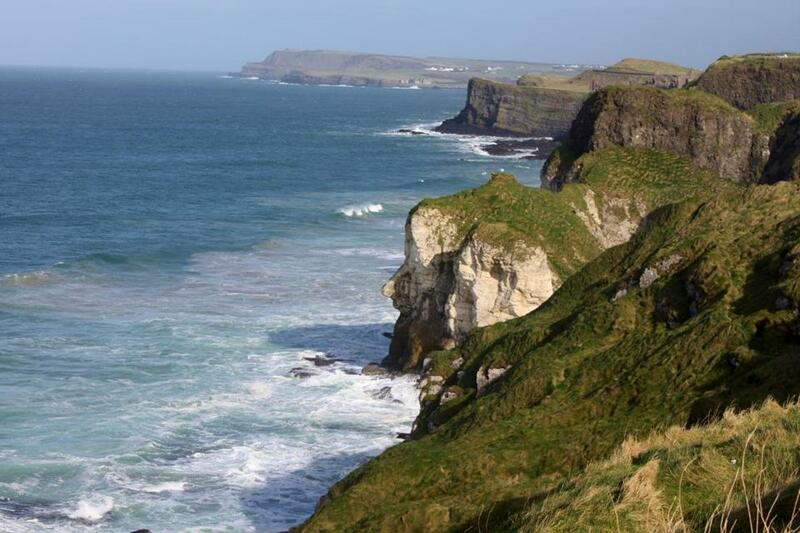 Causeway Coastal Route on Northern Ireland’s northern-most coast. 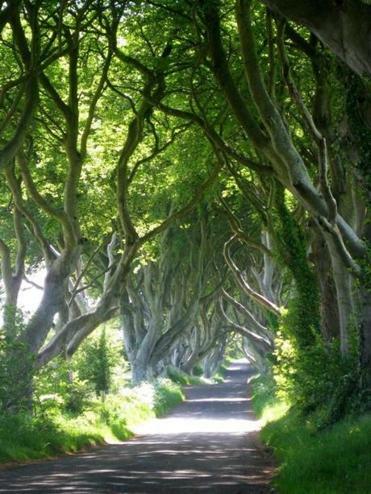 Another key location for “Game of Thrones” is Northern Ireland. Indoor scenes are recorded in the Paint Hall Studio in Belfast, and outdoor scenes are filmed in the wild, rugged landscapes and along the jagged coast, carved over eons by glaciers and the Atlantic Ocean. Here, “Game of Thrones” is filmed on mountain tops, under cliffs, in forests and swamps, and on rocky beaches, with the producers admitting that some of the most beautiful locations were the most difficult to get to. The show’s Belfast locations manager, Naomi Liston, says she loved the challenging terrain and finding the best places — and says there’s a lot more to come from there. “We’re in season four, and we’ve only just scratched the surface. One of the show’s first outdoor scenes, where Ned beheads a Night Watch deserter, was filmed on the vast green expanse of the Antrim Plateau above Cairncastle near Larne, just north of Belfast. I drive the Causeway Coastal Route, which winds its way through spectacular scenery. On one side are the nine Glens of Antrim, which have forests, rivers, and waterfalls, and on the other are rugged rock formations and cliffs bashed by waves, with views across to Scotland. The Causeway route takes in parks, castles, and various natural wonders, passing villages such as Cushendun, where you can walk to the caves where Melisandre of Asshai gave birth to her “shadow baby,” which killed Renly Baratheon. Farther north at Murlough Bay, Theon Greyjoy and his sister Asha rode through on horseback when he returned to the Iron Islands. I drive along the coast to the main setting for the Iron Islands, the fishing harbor at Ballintoy, where Theon returned home to Pyke after 10 years in Winterfell. Set against a backdrop of steep cliffs, where the rocky outcrops have been sculpted into unusual shapes and caves by the salt water of the Atlantic, the sheltered harbor is full of colorful fishing boats. It’s a peaceful area to walk around; there aren’t many people, just the sounds of crashing waves and the odd cry from a gannet. Farther east, just past the Giant’s Causeway, the beach at Downhill was used as Dragonstone, where the Seven Idols of Westeros were burned. Standing on the golden sands which stretch for miles, with views over to County Donegal and looking up the cliff to the eye-catching Mussenden Temple, I try to imagine the scene when the gods were destroyed and can almost hear the evil Melisandre chanting how the night is full of terrors. The next location also has a haunting feel: the eerie Dark Hedges, where Arya Stark traveled on a cart to escape King’s Landing. It’s inland, on the Bregagh road near Stranocum, a pleasant drive along narrow, winding roads between fields dotted with sheep. The gnarled branches of ancient beech trees have twisted together to form an almost supernatural arch leading to a private estate, and the place seems eerily dark, even on a bright day. No surprise that it’s said to be haunted by a ghost called “The Grey Lady” who appears at dusk. 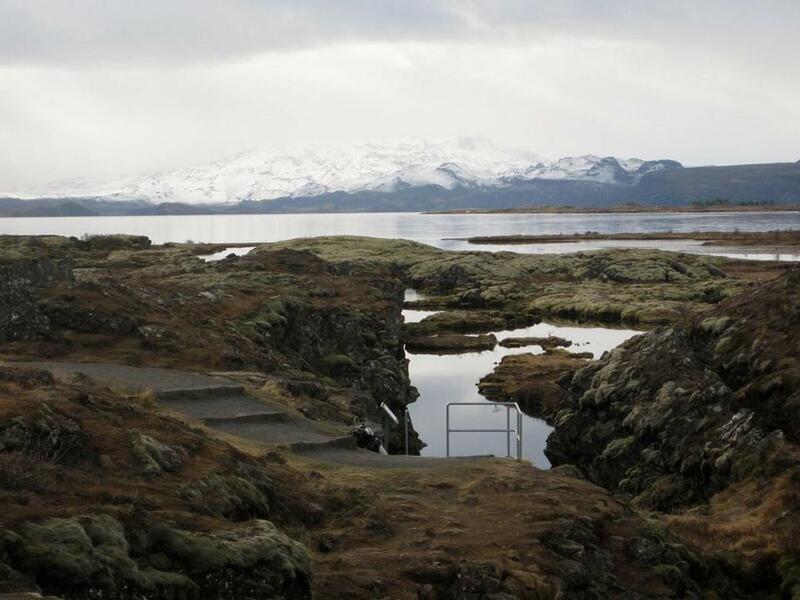 “Game of Thrones” filmed for weeks in Thingvellir National Park. I follow the “Game of Thrones” trail beyond The Wall to the frozen landscapes of Iceland, where Jon Snow entered the land of Wildings and White Walkers. Scenes were filmed at various locations, including the Svinafellsjokull glacier and near Hofdabrekka Heath in the south. The wildling camps in the third season were filmed at Lake Myvatn in the northeast, which is surrounded by mysterious volcanic lava fields — which are common in much of the country. Iceland is full of geothermal lakes and springs; plumes of steam rise randomly from the landscape as we drive along the road. The cave of Grjótagjá, which has a geothermal spring inside, is where Jon and Ygritte have their first romantic encounter. I spend a night beside Thingvellir National Park, north-west of Reykjavík, where scenes from season four were filmed. It’s a barren landscape, of muddy, grassy, and sometimes ice-covered volcanic lava fields and low surrounding hills. There’s almost no vegetation, just odd clouds of steam rising from the land. It’s away from any towns, so the perfect place to see the aurora borealis. Iceland, a land forged by fire and sculpted by ice, is another perfect location for the fantasy series, but as scary as White Walkers and Wildlings can be, Iceland is full of real stories of elves and trolls, ghosts and ghouls, which I hear about regularly on my travels. Everywhere is a story. The Mediterranean island country of Malta was used as a location, with the medieval city of Mdina serving as King’s Landing in season one. Scenes in the Red Keep were shot at the San Anton Palace (the home of Malta’s president), Fort Ricasoli, and Fort St. Angelo, both in Valletta, and St. Dominic Monastery in Rabat. Daenerys’s memorable wedding scene to the Dothraki warlord Khal Drogo was filmed at the Azure Window, an eye-catching rock formation at Dwerja on the neighboring Maltese island of Gozo, which visitors can explore by foot. Other locations used briefly in the series include Duone Castle in Stirling, Scotland (Winterfell in the pilot episode) and Morocco — the ancient fortified village of Ait Benhaddou in Ouarzazate represented various cities in Essos, while the historical coastal town of Essaouira was one of the locations used for the city of Astapor, where Daenerys recruits her unsullied army. Yvonne Gordon can be reached @yvgordon.